Pangolins (or scaly anteaters) are mammals which live in Africa and Asia. They have scales on their skin. They are the only mammals which have this adaptation. There are three genera of pangolin, all of which eat ants and termites. They catch their food using their tongues, and they do not eat anything else. 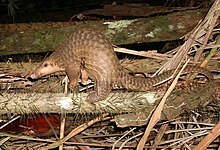 Pangolins have features of armadillos (long, ant eating tongue and broad tail) and sloths (claws), but the pangolin is in a completely different order. The pangolin belongs to the order Pholidota. Pangolins have is marked by large, hardened, overlapping plate-like scales. The pangolin scales are made of keratin. and are attached to muscles under the skin. and can be moved to point towards predators. Hair grows between the scales and near the rear of the animal. 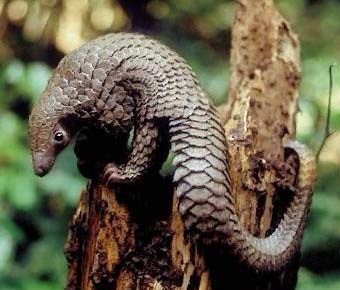 The pangolin's scaled body is a bit like a pine cone or globe artichoke. It can curl up into a ball when threatened, with its overlapping scales acting like armour while it tucks its face under its tail. The scales are sharp, providing extra defence from predators. A pangolin's main predators are wild cats, hyenas and humans. A mother pangolins gestation period is between 120 to 180 days. Young pangolin are born with scales, and they harden by the second day the pangling is out of the womb. When walking on a level surface the pangolin is bipedal. It walks on the back legs. Its body is held horizontal, and is balanced by its heavy tail at the back. ↑ Wang, Bin (2016). "Pangolin armor: overlapping, structure, and mechanical properties of the keratinous scales". Acta Biomaterialia. doi:10.1016/j.actbio.2016.05.028. ↑ Yu, Jingyu et al (2015). "The first birth and survival of cub in captivity of critically endangered Malayan pangolin (Mariis javanica)". Agricultural Science & Technology 16 (10). Wikimedia Commons has media related to Pholidota. Wikispecies has information on: Pholidota. This page was last changed on 6 June 2018, at 10:57.